This is a ghosted enemy that's designed with customization in mind. This is a ghosted enemy that's designed with customization in mind. I may update it in the future with more attacks and movement behaviors that people suggest. Update 4/13/18: Minor update. I fixed some basic ghost settings that should've been enabled from the start. Enemies can now be stunned. I also added a flag for enabling knockback. Warning: This is an Autoghosted enemy. This means you need to not just have the ghost.zh header imported, but you also need the GhostZHActiveScript (included in ghost.zh) in your Active global script slot. Without this, the enemy's script will not load even if you set it as instructed in the enemy editor. First, you'll want to set up the constants at the top of the script for your quest. There's three colors used for the lasers and three SFX for teleporting, lasers and summoning. Attribute 1: This is the enemy's movement style. See Movement for further details. Attribute 2: This is the enemy's first attack (0 for none). See Attacks for further details. Attribute 3: This is the enemy's second attack (0 for none). See Attacks for further details. Attribute 4: This is the enemy's third attack (0 for none). See Attacks for further details. Attribute 7: Set this to how big you want the enemy to be, in tiles. If it's a square enemy this is both the width and height. Otherwise set it to Height*16+Width. Attribute 8: Set this to give the projectiles the enemy fires a different sound. Attribute 9: Set this to give the projectiles the enemy fires a different sprite. Attribute 10: Set this to the sum of all the enemy's flags. See Flags for further details. Attribute 11: Set this to the first of the enemy's combos. The enemy's combo setup is walking combos followed by attacking combos. There can be 2, 8, or 16 combos total depending on flags. Attribute 12: Set this to the slot this script is loaded into. 0 - Halting Walk (4 Directional): This is the standard walking enemy behavior in the enemy editor where it walks for a bit and then stops to shoot. Uses all the enemy editor fields it normally would. 1 - Constant Walk (4 Directional): This is the same as above but minus the halting period. Attacks will still trigger periodically based on Halt Rate. 2 - Constant Walk (8 Directional): This is the standard Bat behavior from the enemy editor. Uses all the fields it normally would. Attacks will still trigger periodically based on Halt Rate. 3 - Walk Toward Link: This makes the enemy move straight towards Link constantly. Step speed determines how fast it moves. Attacks will still trigger periodically based on Halt Rate. 4 - Wall Bounce: This will make the enemy move in a random direction and bounce off any walls it hits. Step speed determines how fast it moves. Attacks will still trigger periodically based on Halt Rate. 5 - Periodic Re-aim: This is like Walk Toward Link only the enemy is a little less persistent, instead walking in one direction and updating its aim periodically. Step determines how fast it moves. Attacks will still trigger periodically based on Halt Rate. 6 - Lazy Chase: This will make the enemy accelerate towards Link gradually, floating about in a sort of orbit pattern around him. Homing factor determines how fast it accelerates. Step speed determines its top speed. Attacks will still trigger periodically based on Halt Rate. 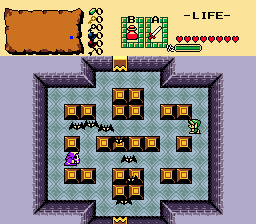 7 - Hopping: The enemy alternates between pausing and hopping towards Link. Every time it lands it has a 1/Random Rate chance of attacking. 8 - Teleporting: The enemy teleports around. Every teleport it has a 1/Random Rate chance of attacking. The enemy can have up to three different attacks, but setting attack 2 or 3 to 0 can change the size of the attack pool to something less. If all attacks are 0, it won't do attacks at all. 1 - Lunge: The enemy lunges at Link to deal contact damage. 2 - Projectile (Directional): The enemy fires a projectile in the direction it's facing. 3 - Projectile (Aimed): The enemy fires a projectile at Link. 4 - Triple Shot (Directional): The enemy fires a triple shot in the direction it's facing. 5 - Triple Shot (Aimed): The enemy fires a triple shot at Link. 7 - Stream (Aimed): The enemy fires 10 projectiles at Link. 8 - Breath (Directional): The enemy fires a spread of projectiles in the direction it's facing. 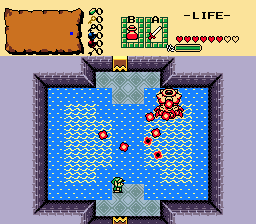 9 - Breath (Aimed): The enemy fires a spread of projectiles at Link. 12 - Bullet Barrage: Fires several rounds of tightly grouped projectiles at Link. 13 - Bullet Swirl: Fires 5 streams of projectiles in a circular swirl pattern. 14 - Bullet Rings: Releases 3 rings of bullets. 15 - Laser: Fires a laser at Link. 16 - Large Laser: Fires a double damage large laser at Link. 17 - Laser Spread: Fires a spread of 5 lasers at Link. 18 - Laser Cross: Fires four lasers in a cross pattern that spin around it. 19 - Summon 1 Enemy: Uses Attribute 6 for the enemy ID. 20 - Summon 2 Enemies: Uses Attribute 6 for the enemy ID. 21 - Summon 3 Enemies: Uses Attribute 6 for the enemy ID. 22 - Homing Shot: Fires a single slow moving projectile that homes in on Link for a little while. 23 - 5 Aimed Shots (With Delays): Fires 5 projectiles at Link in succession. 24 - 10 Aimed Shots (Quick): Fires 10 projectiles at Link in quick succession. 25 - Aimed Bullet Circle: Fires a circle of projectiles that aim at Link. 26 - 4 Way Shot (Normal): Fires projectiles in 4 directions. 27 - 4 Way Shot (Diagonal): Fires projectiles in 4 directions diagonally. 28 - 8 Way Shot: Fires projectiles in 8 directions. 29 - Bullet Storm: Fires a storm of projectiles from one side of the screen. 30 - Laser Storm: Fires random lasers horizontally. 31 - Laser Expansion: Fires vertical lasers expanding from the enemy's position. Add these numbers together in the enemy's attribute 10 to give it these effects. 4 - Flying: Makes the enemy ignore pits, water, and solidity and be blocked by No Flying Enemy combos. 8 - Aquatic: Makes the enemy's movement limited to water combos. 32 - Explode on Death: Makes the enemy explode when it dies. 64 - Face Link: Makes the enemy face Link while moving. 128 - Unblockable: Makes all the enemy's projectiles unblockable. This script requires ghost.zh, std.zh, and laser.zh. This is awesome and based! Loved the original newbie boss by Moosh. Will definitely look into this one! Great! These new attacks will come in handy! Thanks for the update Avataro!